This is Picture of the Day, Volume 2. 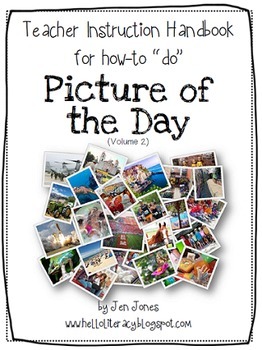 Picture of the Day, Volume 1 is my #1 Bestseller due to the high level of interest, engagement, language and higher order thinking. See Picture of the Day Volume 1 to read over 1,700 comments left by buyers. In my opinion, this set of 190 pictures is even better than the first set with people (young and old), places, scenes and objects with all 7 continents represented. When Picture of the Day is done daily, by the last day of school, your students will have taken an entire trip around the world! This no-prep, no print product is a great way for students to practice three very important reading skills - observing details by being able to describe them and making inferences about what you notice and observe based on what you see and what you already know. 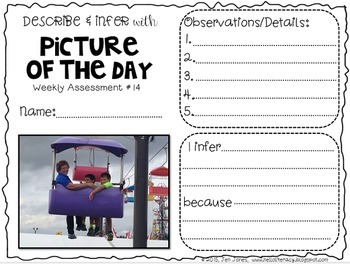 Observing, describing and making inferences are what good readers do. 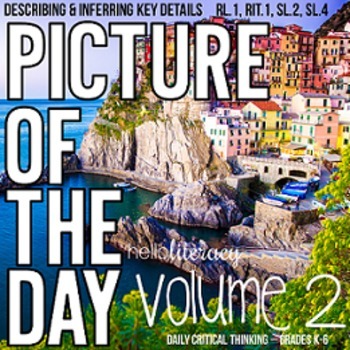 This product uses pictures to give students an opportunity to practice these important skills & strategies without text, but helps them transfer the same line of thinking when reading text. I used this all last year with my reading groups and students LOVE it! They become such "close" observers and inference makers based on details and evidence in the picture. Pictures have recently become popular for teaching inferences and Picture of the Day has become a regular column in the New York Times Education section. Pictures used in this product are generously donated from friends and family of Hello Literacy. Pictures represent populations and cultures from all over the world. Please note: Pictures in the slideshow are not meant to be printed out, just projected on an LCD projector, computer screen or viewed on an iPad. Only the assessments are meant to be printed and copied for students (38 pages). Be sure to check out the product preview above and if you have any questions, read by blog post about POTD, and if you have any questions, please utilize the "Ask a Question" tab at the top of this product. If you're looking for another high quality cooperative, collaborative, 21st century (critical thinking and communication) center, check out my product: Shades of Meaning - Vocabulary and Word Work Center. 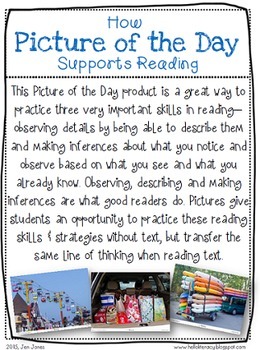 © 2015, Hello Literacy, Inc., Describing & Inferring Details with Picture of the Day: Reading Photos Closely - Vol. 2. For single classroom use, please purchase multiple licenses (at 50% off the regular price) at check-out for whole-grade or school-wide use.